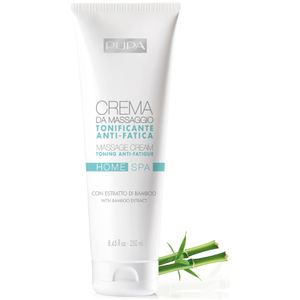 Invigorate your senses and skin with the Anti-Fatigue Home Spa Massage Cream from PUPA. The velvet-smooth, emollient-rich formula effortlessly absorbs into skin, ideal for an indulgent massage with aromatherapy benefits. Fortified with extract of Bamboo, the cream envelopes skin in a soothing veil of moisture and nutrients, leaving skin feeling toned and balanced. A harmonic blend of Orange Oil and Cedarwood create a revitalising fragrance that lingers. Skin feels supple and softened while your senses feel uplifted and recharged.